overlap the objects to create interest. read design principles chapter well and reattempt the drawing. 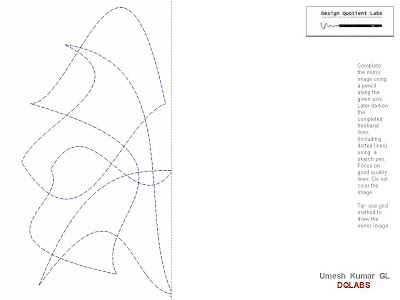 Also go through 2d composition of vidhya , meher and other studetns to get the expected qaulity. submit your drawing by 13th april before 5 pm. I have sent you next assignment by email. please submit it asap. implement the feedback and submit both the 2d and 3d compositions by 24th march. 1.From a balcony of your fourth floor apartment you are looking at a small place of worship surrounded by a garden. Depict the scenario on a busy sunny day. Use an appropriate pencil as a medium. 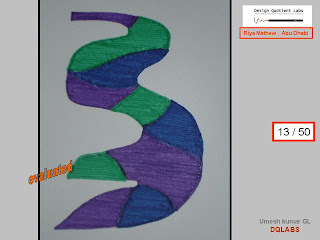 2.Using in desired numbers, the basic geometric shapes found in a bicycle, make a visually appealing composition without overlapping the pieces and colour it using three colours in a medium of your choice. 3.Sixteen wooden cubes in four different colours are available with you. Make useuse of these cubes to create a show piece that can be displayed in your drawing room. correct the drawing and submit it by 3rd feb. also draw a hotel lobby in perspective and submit the same. 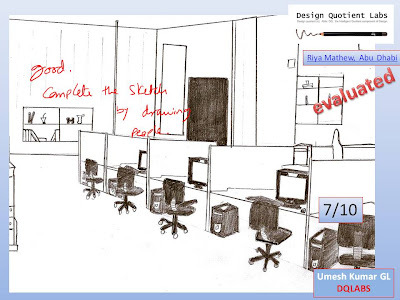 Now visualise and draw a theme sketch of computer Lab. use one point perspective princples and submit the drawing by 25th jan.
Good.this is the kind of performance you are required to do in the exam. now lets move onto the theme sketching. i will send you a mail with some instrcutions in it. follow them and submitt the drawings by 15th jan.
Dear Riya, Always keep in mind the purpose of answering this test. NATA wants to test you some abilities and skills. this is a means of showing your abilities. you cannot afford to lose your focus. your freehand skill has gone haywire. you have done so many exercises on it and perfected it. and at the time of showing your ability you are neglecting / not doing it properly. I believe you can do a lot better if you give due attention and care. you have to put a conscious effort, attempting to get every aspect as perfect as possible. redo the assignment and submit it by 14th jan. do a good job. good job. i guess now you know how to select interesting color schemes. 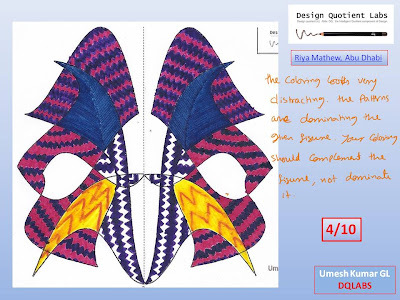 now answer the mock test 2 freehand drawing and submit it. 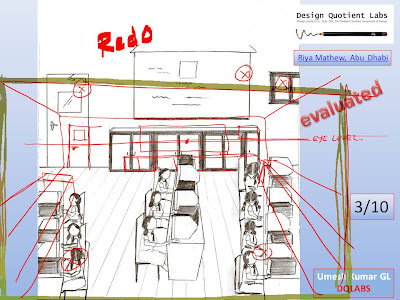 if you score well in it, we will go to next topic - theme sketching. read the theory of colors chapter. understand the different color scchemes. use split complimentary and double split complimentary combinations and color the pattern given in hte book in 5 different (split and double split) color combinations. you need to refer color wheel to detrmine those color combinations. 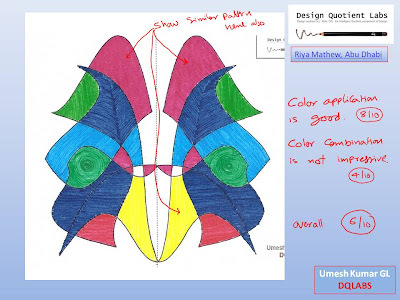 submit the drawing by 7th jan. use sketchpens and create interesting stroke patterns. write to me if you have any doubts. dear Riya, can you explain the reason behind the color selection. why you have chosen yellow+blue+white and other color?....and the pattern you have drawn is too dominating. avoid such patterning. the way you have done your previous coloring is very good except for the color choice. you just need to improve your choice of colors. you dont have to add new kind of paterning. submit your reason behind color selection by 4th jan. i will help you in choosing more apealing color combinations. color application has come good, however similar paaterns can be shown all over the image. color combination is not impressive. i advise you to read through the color theory and princplies of composition chapter and try recoloring implementing those concepts. submit your drawing by 3rd jan. if you have any problem in understanding the concepts, please let me know. i think you can use sketchpens for coloring. you need to explore more with using sketchpens. now you have colored the sketch with horizontal pen strokes. 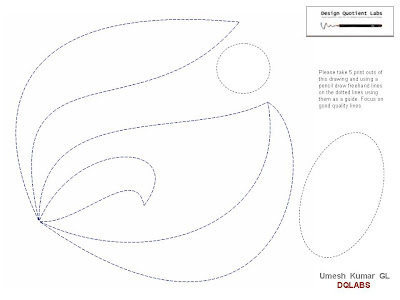 you can get creative by changing the direction of these strokes more sympathetic to the flow of the spaces. i suggest you recolor this drawing using a different stroke pattern. good improvement, but there is still scope for improvemnt. you need to do daily practice to accomplish good freehand lines. now lets move onto the coloring . take multiple copies of th eabove assignment. use 3 different mediums that you are comfortable with(color pencil / water color/ crayons/ sketchpens) and color the drawing. read through the coloring chapter for the choice of colors. submit the drawings by 30th october 2008. The proportion of the drawing is good, however there is a lot of scope for improving your freehand lines. PLease make one last attempt ingettign the freehand good. practice , practice, practice. just make sure that when you attempt to draw the freehand lines, your palm moves smoothely along the line you draw. move you palm in the direction of the line a few times before you actually draw the final line. you can draw it better. please submit the drawing with good lines by 18th october. after that we shall move on to the next aspect- coloring. please redo the assignment and submit by 10th october. good job. always try to get freehand lines like this. 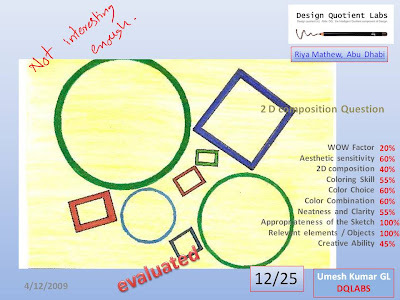 Dear Riya, i can see a lot of improvement in the ine quality. i believe you can do it much better. 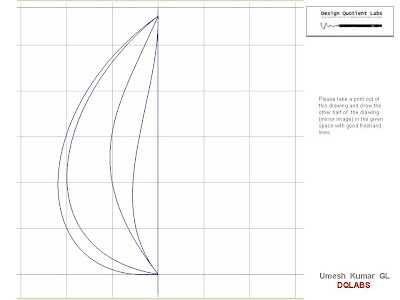 please give one final attempt and get the most appropriate freehand lines. then we shall move onto the next assignment. submit hte drawing by 30th september. submit the assignment by next sunday. line quality is better than the previous attempt. Good work. 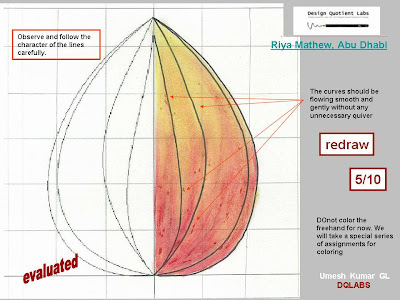 write down the method you have used to draw the above freehand drawing in the comments section. Next assignment will be given accordingly. For the next submission onwards. please try to scan the images rather than photographing them. I used the grid method that was given in the study material. I had already submitted my free-hand drawing on 19th August. Did you receive it sir? I read the colour theory chapter but did not understand anything. It is said that split complementary scheme combines the 2 colours on the either side of the colours compliment . 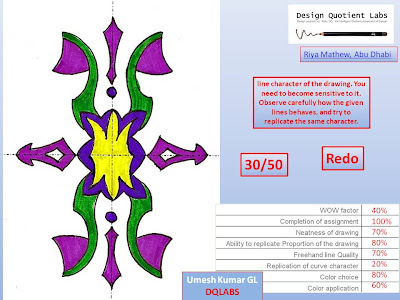 An example is also shown (ie purple and red, its compliment colour given as green) so should I use all the three colour and make 5 different colour combinations or should I use purple – red and make 5 different colour combinations. I did not understand that also…can you give me examples. Here too am I supposed to use all the 4 colours. Tip- use light colors for maximum spread areas and bright colors for minimum spread areas and try to create a balance between color contrasts, so that the whole drawing looks balanced and aesthetically pleasing. If you have a 24 / 48 shade color sketch pen set, you can use different shades of a color to make the drawing look dramatic. For example. Red, purple, green – all are very bright colors. In this case if you have a 48 color shade sketch pen set, you can use light green and light purple for maximum coverd areas and tinges of red at strategic areas to create interest in the drawing. So this combination uses only 3 colors – light green. Light purple and red. If in the exam they ask you to use 4 colors then you can chose a darker shade of the same color to add to your color combination. Example – light green, dark green, light purple and red. Or any other option that fits the split complimentary color theory. This same logic can be applied for double split complimentary color scheme also. The reason for using these color theories is that this is a very well researched area and by choosing the color combinations applying color theory , the chances of creating good color combination is very high. oops...thanks for informing.....but the assignment is for you...so go ahead and attempt it. I have not received the mail yet sir, which you have mentioned on my page...It is written I have to submit the theme sketch by 15th January , but did not receive mail, how will I submit it tomorrow. if you are able to open .doc, that is fine. both the attachments(.doc and .docx) contain same reading material. 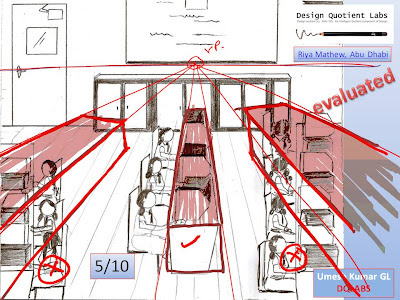 You had asked me to submit the 5 drawings of one point perspective in the attachment you gave. Which are the five drawings? I drew the entrance to college, the kitchen view, the living room with the two tables. All these pictures had Example 1 and Example 2 written underneath it so I drew them. Should I draw the object and people in one point perspective also. There are four pictures of the same, should I draw all the four? Then, what is the fifth drawing? please copy / redraw all the drawings in the document and submit them. the purpose of this assignment is to get you acquinted to one point perspective drawing. observe how the horizontal linea nad vertical lines behave in one point perspective. also observe how the size of same object changes in one point perspective.